Challenges in Titanium Recycling – Do We Need a Specification for Secondary Alloys? CALPHAD XXXIV, An International Conference on Phase Diagram Calculation and Computational Thermochemistry, May 22-27, 2005, Maastricht, The Netherlands, p.114. Brücken für die Forschung, Einfuehrungstagung, Alexander von Humboldt Foundation, Bonn, 19.-21. April 2005, Germany, p.65. Elektroschlackeschmelzen von aluminothermisch hergestellten Titan-Aluminiumlegierungen – eine Alternative zum Kroll Prozess? Wasserstoffgehalte in aluminium- und zinkhaltigen Kupferlegierungen. In: D. Hirschfeld (Hrsg. ), Nichtmetalle in Metallen 2000. Clausthal-Zellerfeld: GDMB-Informationsgesellschaft mbH. Karsten Neumann, Bernd Friedrich, Krone, K.
Hydrogen in aluminium containing copper alloy melts-solubility measurement and removal. In: K. Ehrke, W. Schneider (Hrsg. ), Continous Casting (S. 15 - 19). Weinheim: Wiley-VCH. Challenges in Titanium Recycling - Do We Need a New Specification for Secondary Alloys? Roger Sauermann, Bernd Friedrich, Bünck. M.; Bührig-Polaczek, A., Uggowitzer, P. J.
Semiramis Friedrich geb. Akbari, Bernd Friedrich, Akbari, S.
Advanced Engineering Materials 2007, Volume 9, No. 4, S. 246 â€“ 252. Srecko Stopic, Bernd Friedrich, Jokanovic, V. ; Cvijovic, Z.
Aluminium-Lithium alloy development for thixoforming. In: Proceedings of European Metallurgical Conference, 16. - 19. September 2003, Hannover, Vol. 3, S. 1348 - 1349. Computational Materials Science, Vol. 38, Issue 2, 2006, S. 374 - 385. 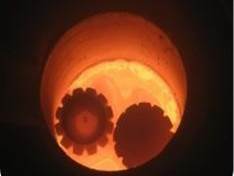 Selection of Crucible Oxides in Molten Titanium and Titanium Aluminum Alloys by Thermo-Chemistry Calculations. Journal of Mining and Metallurgy, Heft 41 B, 2005, S. 113 - 125. Zeitschrift für Metallkunde, Jg. 95, Heft 12, 2004, S. 1097 - 1104. Modelling the Copper Primary Production - A scenario approach to technique variation impacts. Elektroschlackeschmelzen von aluminothermisch hergestellten Titan-Aluminiumlegierungen - Eine Alternative zum Kroll-Prozess? Berg- und Hüttenmännischen Monatshefte (BHM), Heft 146/5, 2001, S. 203 - 209. Development of Al-Li-based Alloys for thixoformed Automotive Parts. In: Proceedings of European Metallurgical Conference, 18. - 21. September 2005, Dresden, Vol. 4, S. 1471 - 1483. Production of Gamma-TiAl-Ingots by Aluminothermic Reduction of TiO2 and Refining by ESR. In: Proceedings of European Metallurgical Conference, 18. - 21. September 2005, Dresden, Vol. 4, S. 1429 - 1444. A New Processing Route for Titanium Alloys by Aluminothermic Reduction of Titanium Dioxide and Refining by ESR. In: Proceedings of 10th World Conference on Titanium, Hamburg, 2004, S. 2209-2216. Weinheim: WILEY-VCH.